Do you ever get a craving for a little something sweet (and maybe chocolate), but there's nothing on hand and you're just not in the mood to make a big mess and a big batch of something? Maybe you're thinking a small pan of brownies wouldn't be much trouble, but you're out of eggs and butter. Well, here you go! 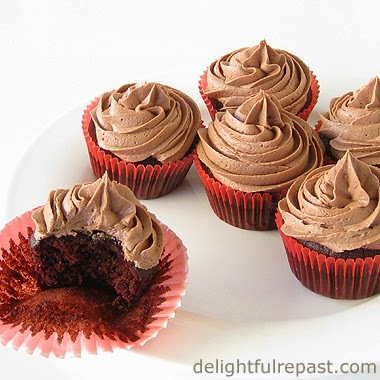 Six chocolate cupcakes you can stir up quickly by hand in one bowl. No eggs, no butter, no milk? No muss, no fuss, no problem! It's the thing I love best about having a toaster oven. Sure I can bake big loaves of bread and 13-inch pizzas in it or cook a good-sized casserole, but what I'm really having fun with is developing recipes for quick and easy small-batch treats. I don't know about you, but there are a lot of us who really don't need to have two dozen cupcakes sitting around staring at us every time we walk through the room. Six is the perfect number, and the pan fits easily in the toaster oven. Actually, a full-size 12-cup muffin tin fits easily in it, but I don't need to have even one dozen cupcakes sitting around! My new Cuisinart convection toaster oven broiler has lots of features I haven't figured out yet. Like convection and speed convection. I'm sure they're going to be really handy once I sort it all out. In the meantime, it's wonderful to be able to pull out of the freezer just enough frozen scoops of homemade Oatmeal Cookie dough to fill the 13x9x1-inch pan that came with the oven. Or pop in a quick batch of six cupcakes. It just never felt right to heat up my big gas oven for such small amounts of food. 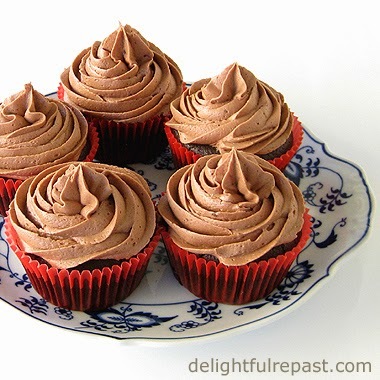 If you want to frost the fluffy chocolate cupcakes as pictured, this recipe calling for just 3 tablespoons of butter (or something else, if you're vegan), makes precisely enough frosting for 6 cupcakes. I absolutely hate waste, and does anyone ever actually use the leftover frosting they put in the refrigerator? Better to make only what's needed! 1 Preheat oven to 350 degrees. Put standard paper bake cups in one 6-cup standard muffin tin. 2 In 1-quart bowl (I use a Pyrex 4-cup measuring cup), whisk together flour, sugar, cocoa, baking soda and salt. Add water or coffee, oil, vinegar and vanilla extract. Whisk vigorously for about 1 minute, or until smooth. 3 Using a scant 1/4-cup measure, fill the bake cups. You will need to scrape the bowl and measuring cup; there is no waste with this recipe! Bake at 350 degrees for 16 to 18 minutes, or until they test done with a toothpick. 4 Immediately remove from pan and cool on wire rack for an hour. They must be thoroughly cool before frosting. 5 In 1-quart bowl (I use a Pyrex 1-quart glass measure), with a hand mixer, cream the butter until smooth. With the mixer on low speed, gradually beat in the powdered sugar, cocoa and salt. Scrape down the sides of the bowl. Add the vanilla extract and liquid; beat on high speed until frosting is light and fluffy, about 5 minutes. 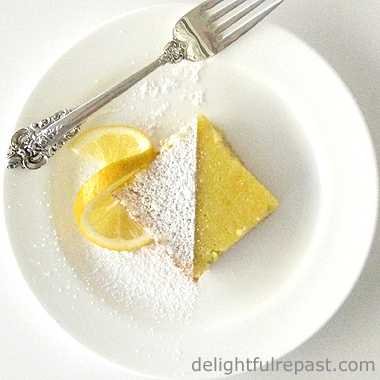 You will likely have to add the liquid ingredients before adding all the powdered sugar. 6 With a pastry bag fitted with a 2D tip or a 1M tip, pipe frosting on cupcakes. Though Cuisinart provided the oven, the opinions expressed at Delightful Repast are entirely my own. I always tell my readers what I really think! 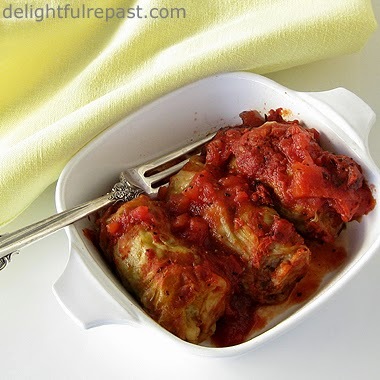 Golumpkis or galobkis (or kohlrouladen or holishkes or any other name for stuffed cabbage rolls) are not my traditional English food or Southern food. But I do deviate quite often from the heritage cooking I love. Germany and eastern European countries and cultures all have their own versions. My version is the one a very close friend grew up with. She used to make it with her mother, a Russian-born German with maybe some sort of Polish connection. I was very close to her as well and deeply regret that the three of us never quite got around to making these together. It's still my heritage cooking in a way, because my closest friends are family to me. Just as I always think of my friend Julia and her mother Mimi whenever I make Mexican Rice, I will always think of dear Elsie (I called her Grandma) whenever I make golumpkis. Last month the daughter and I finally got around to it. We started with her mother's recipe written on a card, without too much in the way of directions, and tried to recreate the magic. 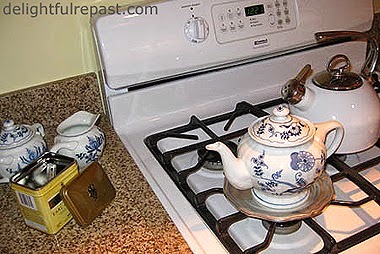 We even used the pan, a huge enamelware covered roaster, she always used. We decided, the first time we made them, that we would always make them together. If you're making a big batch (and you might as well because they freeze beautifully after cooking and cooling), it would take one person a very long time. Besides, as you can probably tell, I'm quite nostalgic in the kitchen; and making Grandma's golumpkis together is a sweet way to remember her. The second time around, I suggested replacing the canned diced tomatoes with Muir Glen fire roasted crushed tomatoes, something I use a lot. We loved it and knew Grandma would have, too. We also decided to precook the diced onion and add eggs. We resisted our inclination to add herbs and spices. Somehow these nine simple ingredients (and that's counting the water and salt and pepper!) come together in a way that needs no fancying up. * Of course, you can make them larger (and fewer), if you like. 1 Fill a large, deep pot with water. Bring to a boil. Core cabbage and set in hot water, one at a time if pot is not big enough for both, until leaves are pliable. Peel the softened outer leaves off and place them in a colander to drain. Return the head(s) of cabbage to the hot water until the next layer of leaves are pliable. Repeat as needed. 2 Meanwhile, in small skillet, saute chopped onion in oil until softened. Set aside to cool. In large bowl combine cooked and cooled chopped onion, ground beef, rice, eggs, salt and pepper. Mixing lightly with one impeccably clean hand is the easiest way to do it. 3 In bottom of large roasting pan*, combine half the sauce ingredients. Combine the remaining half in a medium bowl (I use a 2-quart glass measure). * I use this Calphalon stainless steel roaster. It's 16x13x4 inches deep, so it can handle this whole recipe in two layers. 4 As you work with each cabbage leaf, cut away the tough core. Cut very large outer leaves in two. Using a #30 scoop or a 1/8-cup measuring cup, place a scoop of filling on the leaf near the stem-end, fold in the sides and roll (rather like a burrito); no need to tie. Place seam-side down in pan. Toward the end, preheat oven to 400 degrees. Tip: Do all the scooping at once. Scoop mounds of filling onto a sheet pan. If there’s still filling left after 60 to 66 scoops, divide the remaining filling among the scoops because there won’t be enough cabbage leaves to make more rolls. 5 Pour the remaining sauce over the cabbage rolls. Cover tightly with heavy-duty foil and bake at 400 degrees for 30 minutes. Reduce heat to 350 degrees, and continue baking for 2 to 2 1/2 hours. Sourdough bread has become a staple in our house. I make it in loaf tins for sandwiches (Sourdough Sandwich Bread) or in artisan loaves round or oval, with unbleached all-purpose flour or with some whole-grain flours mixed in. It's really quite flexible. If you're new to sourdough baking, it's probably a good idea to make just one recipe multiple times to get a feel for it, then branch out from there. If you are gluten-free, you might want to check out the research on sourdough and gluten intolerance. 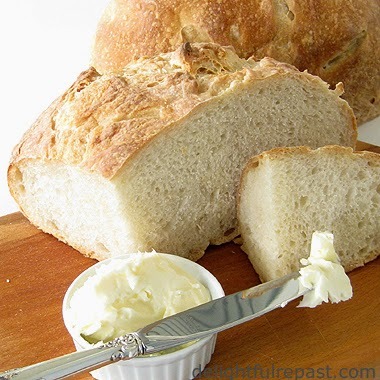 Studies have shown that true sourdough bread (made with wild yeast starter and no added commercial yeast) does not present the same problems as ordinary wheat bread. Some people who have problems with wheat assume it's the gluten, but in some cases the problem stems from the fact that the wheat was genetically modified. And that is something we should all be aware of, whether we have gluten intolerance or not. Check out The Real Reason Wheat Is Toxic. I'm not qualified to give medical advice and am not suggesting that anyone ignore medical advice or what their own body tells them. I just thought the information might be of interest to you. I do recommend using only organic flours as I always do. Postscript: Although conventionally grown wheat in the US might be GMO and/or sprayed, that is not true of all countries, as pointed out by Anne in the comments below. 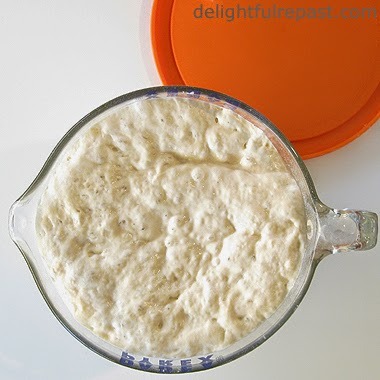 Here is How to Make Your Own Sourdough Starter. 1 Feed up your starter to 2 cups: Take 2 tablespoons starter out of refrigerated storage container. Put it in a 2-cup glass measure (actually holds 3 cups, so shouldn't overflow when starter doubles). Stir in 1/2 cup flour and 1/3 cup water. Stir vigorously, cover loosely and let stand at room temperature for 8 or 12 hours. Tip: See sample schedule below to plan your bake. 2 Stir down starter and add 1/2 cup flour and 1/3 cup water. Proceed as in previous step. 3 Stir down starter and measure 2 cups of starter into 2-quart glass measure. With a dough whisk or large spoon, stir in water, salt and 1 cup flour. When all the flour is incorporated, stir in 2 cups of flour a half cup at a time. Stir until dough just comes together into a shaggy dough (quite stiff, but still sticky). With one hand, knead the dough right in the bowl, just enough to incorporate all the flour without adding more water. At this point, you may gradually add up to 2 tablespoons water, if needed. The dough should be just slightly sticky, not wet. Cover loosely with oiled plastic wrap or lid and let stand at room temperature overnight. Tip: Any leftover fed starter can be added to your stored starter in the refrigerator or just kept on the counter if you're making more bread in a day or two. 5 Let rise until doubled. This can take anywhere from 3 to 5 hours (or longer*). The dough needs to rise until the dough doesn't quickly spring back when poked with a floured finger or knuckle. * When baking true sourdough bread with no added commercial yeast, rise times are not so predictable. It takes as long as it takes. But if you bake fairly regularly, you'll have an idea of how long. 6 When you’ve got about 30 to 45 minutes left, place oven rack in lower-middle position and place pizza stone or Lodge Pro-Logic 14-Inch Cast Iron Pizza Pan on rack. Preheat oven to 475 degrees for at least 30 minutes. 7 Just before baking, brush the excess flour off the parchment, brush the loaf with a little water and cut a "+" about 1/4-inch deep on the top and slide the boule on its parchment square onto the hot stone. Reduce temperature to 425 degrees. Bake for about 45 minutes, or until crust is beautifully golden and middle of loaf is 210 degrees. If it's getting too brown, cover loosely with foil. Tip: You may use a lame (pronounced lahm), razor blade or very sharp knife*. Holding the blade straight, make each cut quickly and about 1/4-inch deep. You might have to make the cuts twice. If the blade seems to be dragging, wet it before each cut. Tip: For reasons I won't go into (something about lactobacilli and yeast and blah blah blah), sourdough bread sometimes doesn't brown as well as other breads. If you're into the well-browned crust, take the loaf from the oven about 5 minutes early and brush the top with a little olive oil and put it back in. 8 Remove from oven, using the rimless baking sheet or pizza peel to lift the boule off the pizza stone. Let cool on wire rack for 1 1/2 hours before slicing. My favorite way of slicing* a boule is to cut the loaf in half, turn the cut side down and slice, but you can make long slices if you like. * Use a very sharp knife to cut the "+"--I use my Wusthof Classic 3-1/2-Inch Paring Knife. For slicing, I use my Wusthof Classic 10-Inch Bread Knife. Like a lot of people, we love tamales but don't want to go to the trouble of making them! Then the restaurant that made our favorite tamales went out of business, leaving us high and dry. What was I to do? I was not in the mood to mess with corn husks or plantain leaves. Tamale-making is really a group activity, and I'm cooking solo most days. 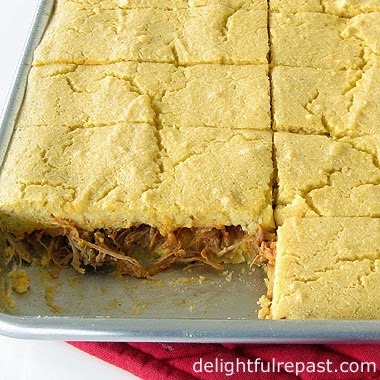 So I thought why not just layer it in a sheet pan and cut it into rectangular "tamales"? First, I cooked the pork in the slow cooker, shredded the meat and poured the braising liquid in a 2-cup glass measure. Next day, I made the sauce and the masa mixture and assembled my "thing." Didn't quite know what to call it. It's not tamales. It's not tamale pie. It's made in a sheet pan, so I decided on Sheet-Pan Tamales. My masa mixture is not the traditional one at all, but it has that masa flavor and aroma. You might want to spice it up a bit more, but I like to make it on the milder side and pass a zesty salsa around the table for those who like more heat. It's nice to have both a green and a red sauce on the table. You know I don't buy out-of-season imports, so in winter I make my Salsa - So Fresh Tasting No One Will Know It's Made with Canned Tomatoes. What do you think? To those who say, Yeah, but they're not real tamales, I say, Yeah, but real tamales weren't gonna be happening any time soon! 1 Put pork shoulder, salt, pepper, marjoram, oregano, onion and wine into slow cooker. Cook on low for 8 hours. 2 Transfer cooked pork to wide bowl and, using two forks, shred pork, removing any visible chunks of fat. Discard onion or reserve for another use. Cover and refrigerate shredded pork. Note: The pork needs to be shredded quite well, leaving no thick or long pieces. 3 Pour braising liquid into 2-cup glass measure. Refrigerate until fat rises to the top and solidifies. Remove the solidified fat. Add enough water to defatted liquid to make 1 1/2 cups. 4 Pour braising liquid into 3-quart saucepan. Add crushed tomatoes, ground chiles and cumin. Heat to boiling. Reduce heat and simmer, uncovered, for 15 minutes or so until reduced a bit. Taste and adjust seasoning. I keep it on the mild side and serve it with a zesty salsa for those who want to heat it up a bit more. 5 Stir sauce gradually into shredded pork. You may not need all the sauce. The shredded pork needs to be moist but not dripping with sauce. 6 Preheat oven to 350 degrees. In large bowl, whisk together the masa harina (I use Bob's Red Mill), baking powder and salt. In medium bowl, whisk together the 4 cups milk, eggs, oil and butter (I use Organic Valley). Add the milk mixture to the masa harina and beat until well mixed. It will be quite thick but should be spreadable. 7 Spray 18x13x1-inch half-sheet pan with cooking spray. Spread 3 1/2 cups of the masa mixture evenly in bottom of pan. 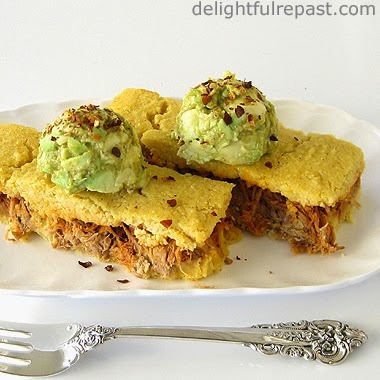 Place spoonfuls of shredded pork over the masa, make an even layer of it and press it a bit to compact it. Gradually add up to 2/3 cup more milk to remaining masa mixture to make it more pourable/spreadable. Place spoonfuls of it over the pork and spread it evenly over the pork layer. Note: Or divide between two 13x9x2-inch quarter-sheet pans. 8 Bake at 350 degrees for about 30 minutes. Let stand for 5 or 10 minutes before cutting into 24 or 32 rectangles. I was invited by Celia at Fig Jam and Lime Cordial to write a post to link to her In My Kitchen, a series that gives us a peek into the kitchens of food bloggers around the world. 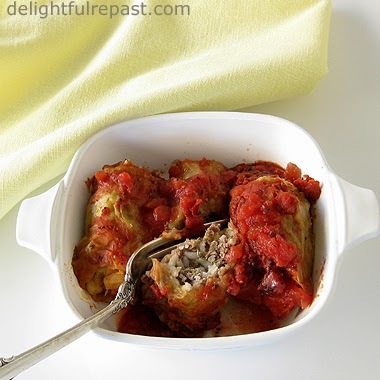 Celia started her blog in February 2009, one year before Delightful Repast debuted in February 2010. She tells wonderful stories and shares my passion for bread. ... January means it's time to make marmalade. 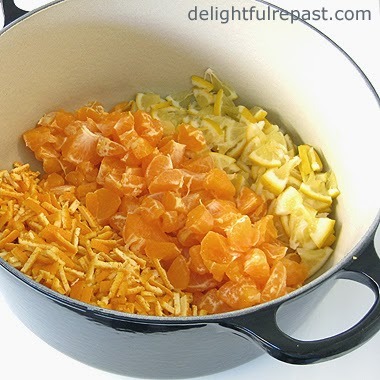 Though I'm in the US, I follow the British tradition of making marmalade in January. 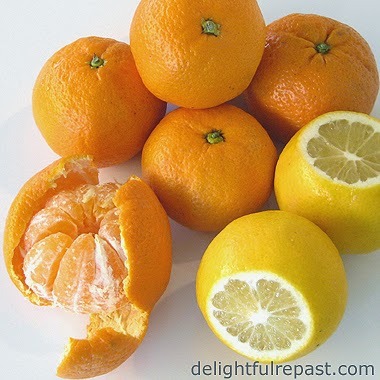 If I can get my hands on some organic Seville oranges (the highly acidic orange of marmalade tradition), I'd like to make a batch and see how it compares to my Kumquat Marmalade. The pantry (or larder) is down to just a few jars of Satsuma and Meyer Lemon Marmalade. 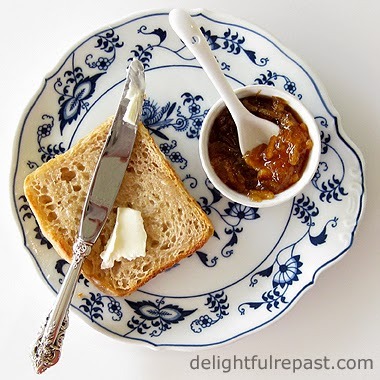 And, of course, marmalade calls for excellent toast. Though I love my English Muffin Toasting Bread for toast, this month the sourdough saga continues! My Sourdough Starter is very vigorous, producing fabulous loaves of Sourdough Sandwich Bread as well as other loaves I've not yet blogged about. If you haven't tried it yet, I hope you will soon. January is a great month for organizing. I'll be collecting things from all over the house to donate. From the kitchen, a pair of bread pans I haven't used in decades because I upgraded. There's more stuff, but I'm afraid that little project will have to be postponed until later in the month as I have finally tackled a huge project in my office: magazines. Over the years I have accumulated more than a thousand magazines, and it's time for them to go! Some are issues of magazines I've written for, some are magazines that my mother had collected and I've held onto for sentimental reasons. Mind you, these are all housed on bookshelves in an orderly fashion; nevertheless, I've decided they are clutter that is weighing me down. A lifelong magazine lover, I have an eclectic collection. Of course, there are many years' worth of Bon Appetit, Saveur, Food and Wine, etc. And I love British magazines, which are so expensive here that I tend to hang onto them forever. I just pulled out a few British editions of House Beautiful and Ideal Home that are from 1993! You think it's time to let them go?! In 2015 I will not be subscribing to any magazines, and I will be letting all existing subscriptions lapse. No matter how fantastic the deal is, I'm going to Just Say No! I'm going cold turkey, baby! I keep telling myself it's just for one year. Hope I can do it. "One day at a time" and all that, right? Whew! After that confession I might have to go have a bit of a lie-down. If you're an "out-there," "tell-all" extravert, that might not seem like a big deal to you. But to an introvert like me, that was a real gut-wrenching soul-baring of epic proportions! Yes, a bit of a lie-down is definitely what's needed. Oh, and could someone fetch me a nice cuppa tea?